So I made this. A variation of the Patriotic Placemat. I bought red hand towels (again Walmart, we only have a True Value and a Walmart. This time I used my Go! cutter. I was able to get the Star Die just in time for the 4th of July. I have been proclaiming for a month that I have zero, zilch in the patriotic decor area. I set out to change that, and it I did!! In case you are interested, I used light weight heat n bond for this project too. 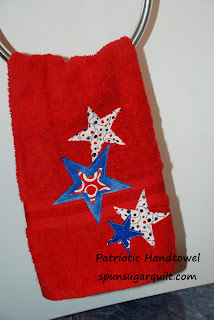 I used the scraps from the Patriotic Pinwheel runner and ironed them onto the heat n bond. I did this in 6" strips which happen to work pretty well with the Star die. Here is my first cut. And the 'waste'. I have been reading reviews that there is waste with the Go! cutter. Here's what I did with my waste. Put them on a star that was the appropriate size and put it through the Go! again. Stars, stars, stars....more than I need. Like the placemat I sewed the stars with a straight stitch to tack them in place because these will be washed. I feel the holiday growing on me, along with my decor! My friend and I set out for Charm, Ohio last Friday. It's about an hour from where we live. Our first stop was Mrs. Miller's. Um, yes I did take this picture on the road from my van. It would have been perfect for retreats. Apparently they are renovating the house next door for retreats. There are at least 7000 bolts of fabric at Mrs. Miller's. And what a super duper cute way to display pre-cuts. A bakery counter. And so many pre-cuts that they have a whole extra cabinet. I spied Fruitcake by Moda. And we were driving so slow I could take pictures at the same time. We were driving 1 mile an hour. Sometimes my husband and I joke that the biggest traffic jam here is a horse and buggy! We arrived at Berlin and Country Craft Cupboard. I would say that it would be a great place for stocking up on your wool or primitive items. We also stopped at Helping Hands. Again sadly, they do not allow pictures. Here's some of my stash acquisition. I don't usually buy fabric for stash. I usually have a reason i.e. backing, a quilt top or binding etc. This was a fun stash building trip. Monluna Mingle and Flutterby by Tula Pink. And a little Paula Prass Flights of Fancy aqua and reds. It was an "exhausting" fabric trip but sooo worth it. Have you been to Berlin or Charm recently? Block 9 went together fairly easily. I brought back more of the yellow and this green to tie it to another block in the group. Whew! 3 left. •navy or royal blue solid placemats. •Here is an example of 2 that I made. My Walmart has several colors of these placemats. The regular price is $1.78 each. 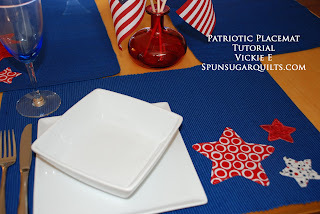 •Remove any stickers or labels from your placemats and set aside. •My picture is dark here, they are really more royal blue. •Make a cardboard or plastic template. •Trace the star design on to the smooth paper side of the Heat n Bond with a pencil. •Cut out stars leaving a 1/4" excess around the drawn pattern. •choose a few scraps of reds and whites. •Iron the stars to the WRONG side of the fabric scraps. •Cut out on the line. •Iron to the placemat as shown. •Using coordinating thread (I used white), sew 1/8 inch along the edge. •There is Heat N Bond holding the appliques but I like the stitching for decorative look and help the placemat hold up IF I have to wash them repeatedly. Click on the picture to print the template or HERE for the pdf to print. Again 2 of the finished placemats. And the setting at the table. Wish I had more time to make projects this weekend. Can you stand another 4th of July post? Auntie Tablecloth on Moda Bakeshop!